Photos of the Church of Sant Clement de Taull, Vall de Boi, Alta Ribagorca, Spain. High amongst the central Spanish Pyrenees mountains of the Alta Ribagorca in the Vall de Boi nestles the village of Taull. In the winter this has become a small ski resort but for hundreds of years the community that lives and farmed these mountains were left along guarded from the outside world by their remoteness. In this time warp Christianity developed churches following the Romanesque style which was typical of the 7th century to the 12th century when the style evolved into the Gothic. It was not until 1907 during a Pyrenean expedition by the Institut d’Estudis Catalan (Institute of Catalan Studies) that their art treasures were discovered. After their finding were published in a book foreign museums and collectors started to buy the Romanesque art of the Pyrenees so in 1919-23 the National Art Museum of Catalonia was able to successfully intervene in order to rescue the frescoes of Sant Clement de Taull and what was left of the churches interior is now housed in the museum in Barcelona. One of the best examples of these Romanesque church of Sant Clement de Taull, the largest in the Val de Boi, its characteristic Lombard architecture and interior decoration make it the symbol of Catalan Romanesque architecture. Its most imposing feature is its bell tower: it is square in plan and soars from a simulated solid base to six storeys.. The church is a basilica plan structure, that has three naves (each of them with a terminal apse), and large columns separating the side naves. 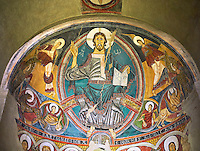 The frescoes are characteristic of Catalan Romanesque which are influenced by Byzantine Roman Iconography conventions. In the apse above the altar is a fresco the Theophany which consist of Christ In Majesty or Pantocrator surrounded by and upright eye shaped mandorla around which are frescoes of the four tetramorphs or the four evangelists, Mathew depicted as a man, Mark as a lion, Luke as a Bull and John as an Eagle. Below this are frescoes of the Apostles of the Virgin Mary and the Apostles. In front of this are two triumphal arches. At the top of the first is a fresco of the “hand of God” (Dextra Domina) and at the top of the second is a fresco of the “Lamb of God (Agnus Dei). The Agnus Dei is a mystic lamb that is presented as having seven eyes and holds a book. On the left side of the same arc, there are scenes of Lazarus, who expresses grief while a dog licks his wounds at the door of a rich man. The columns are made of amalgamated stone, which support the arcades and the roof of the church has wooden beams. The first column on the north side of the church near the apse, was found to have the inscription of the consecration of the church. This document is painted with white letters on red and black background and is now preserved in the National Museum of Catalan Art. 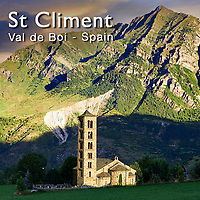 Church of Sant Clement de Taull is a UNESCO World Heritage Site. Our photos and pictures can be bought as stock photos or photo art prints on line.